The Geology group will meet on the 3rd Tuesday of every month at The Sun Inn from 2.00-4.00. 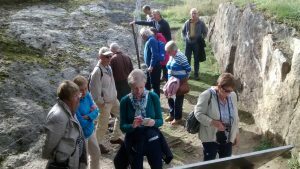 The contact for the group is Jim Stirland on 07977 415 072. January 15th, 1.00 pm at the Sun Inn a planning meeting with fuddle. 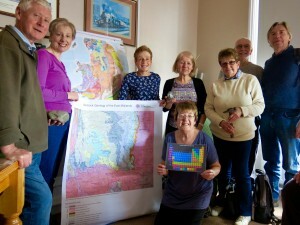 The Geology group has a very full program. They have been doing Rock Identification and also looked at the evolution of minerals, from atoms to rocks. Visits to Nottingham University Geology dept, Creswell Crags, Kimberley Cuttings, Dowlow Quarry in the Peak District and Hope Cement works are planned which will link to the topics they have been studying. 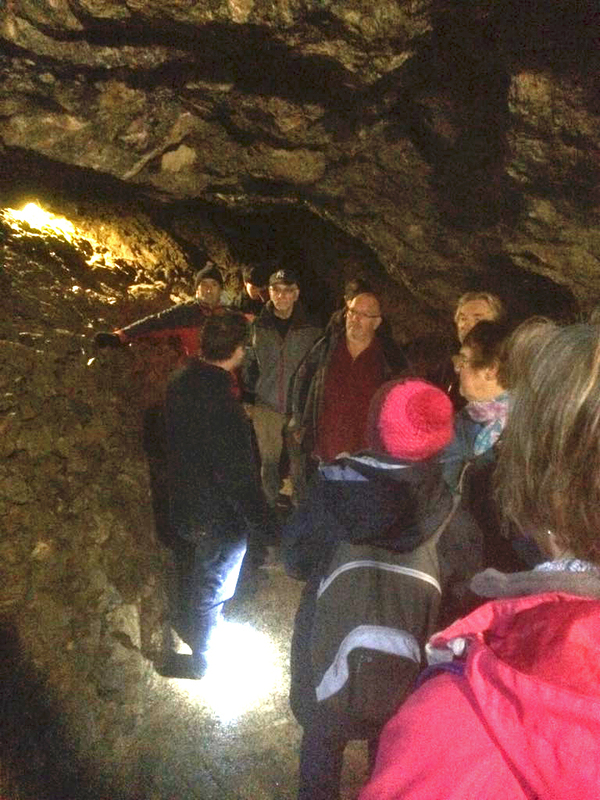 Group visit to Treak Cliff Cavern, Castleton. November 2018. On 20th November the Geology group made their last visit of 2018 to the Treak Cliff Cavern in the Hope Valley at Castleton to experience the wonderful phenomena of ‘Blue John’. It is a very rare variety of the mineral Calcium Fluoride, also called Derbyshire Fluorspar, and Castleton is the only place in the world where this banded variety is found. The Romans while looking for lead first discovered Blue John about 2000 years ago. Treak Cavern was itself started as a lead mine until about 300 years ago when the first Blue John was mined. During the last war the Calcium Fluorspar was used as a flux in the manufacture of steel and aluminium. Today the Treak Cavern mines about half a ton of Blue John during the winter months to be used to produce some stunning jewellery. The cavern also contains some beautiful natural caves, Aladdin Cave, with the Seven Dwarf stalagmites, and Dream Cave with great examples of ‘flowstone’ and stalactites. It is well worth a visit. Jim Stirland. 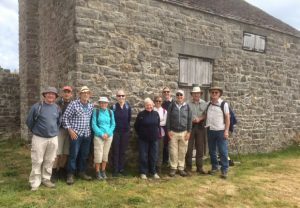 Our Geology Group enjoyed a fascinating visit to Ecton Hill Copper mine in July, this included an underground tour of some of the old workings. Ecton Hill Copper Mines situated in the Manifold Valley near Hartington are some of the oldest and most profitable copper mines in the country. With a vertical “pipe veines” of chalcopyrite, a sulphide of iron and copper, and a copper content of 15% the Duke of Devonshire made a fortune between 1760 – 1825 which funded the building expansion of Chatsworth and the Crescent in Buxton. Stone and bone artifacts found in the mine have been carbon dated to 1880 – 1630BC. The Geological group had a visit to the National Stone Centre at Wirksworth. Gerry the centre manager (blue top in photo’s) led us on a tour round the site. 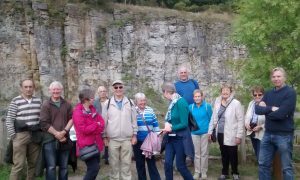 This included the rock strata in the quarry, fossil Crinoids on the exposed limestone, a dry stone wall comprising of 19 sections of different stone from across the UK. We also saw Lead Mines and Lime Kiln’s with an explanation from Gerry of the conditions the workforce had to endure when they were in production.